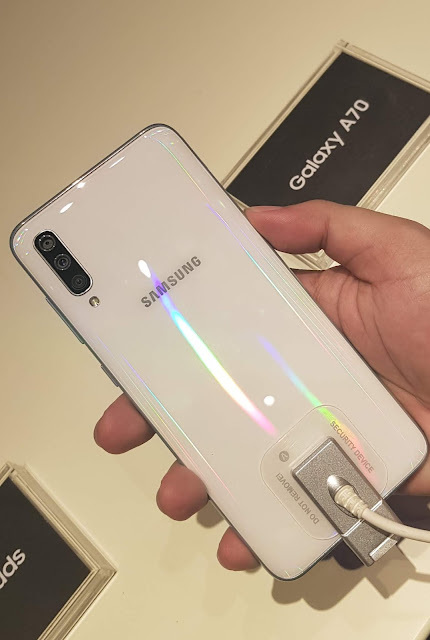 Be ready to be more visually authentic and active as Samsung unveils their latest addition to the Samsung Galaxy A Family the Samsung Galaxy A70. 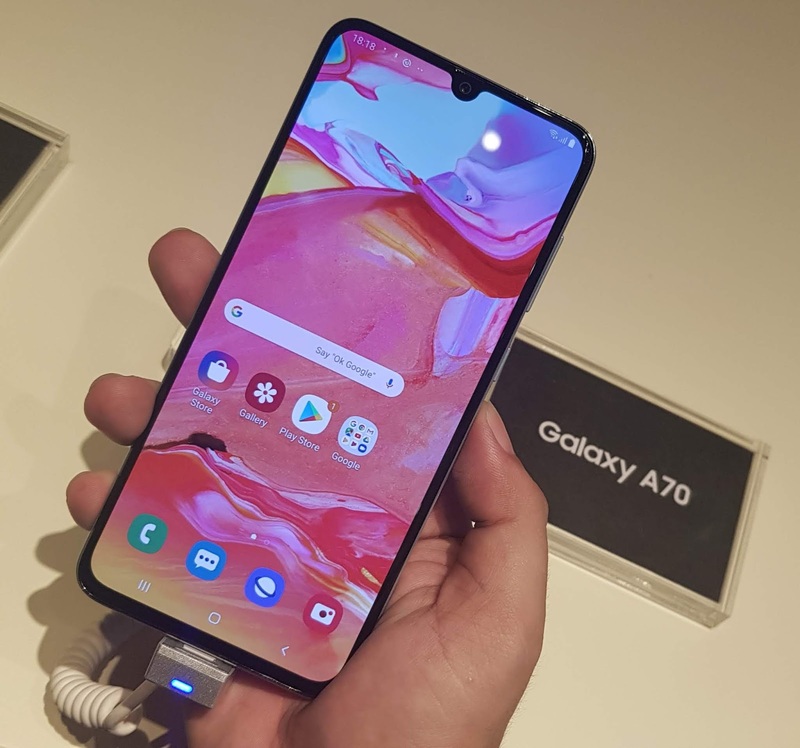 Samsung Galaxy A70 comes to us with an Infinity-U display along with the biggest screen in the Galaxy A portfolio to date, the Galaxy A70 provides a more immersive edge-to-edge experience to everyday activities. The Galaxy A70’s sleek and ergonomic design and a 20:9 display ratio delivers an immersive viewing experience whilst providing optimal grip. Standout with its distinct colors (blue, black, white) that features a stylish prism effect that reveals stunning gradient colors depending on light direction and reflections. You will never miss a moment as the Galaxy A70 comes with an enhanced triple camera with a 32MP super high-resolution front and rear lens, take bright sharp shots that never sacrifice on image quality no matter where you are, or what time of day. The Depth lens enables you to adjust the depth of field to focus before and after taking a shot so people can choose what and where they want to highlight. Combined with the 8MP Ultra Wide Lens, enjoy expansive photos that mirror the same viewing angle as the human eye. Stay online longer and share more videos without worrying about your batter as the Galaxy A70 comes with a powerful 4,500 mAh battery, giving you the freedom and convenience to share, stream and play all day. With Super-Fast Charging at 25W, you can be back in the action faster when you need a battery boost. 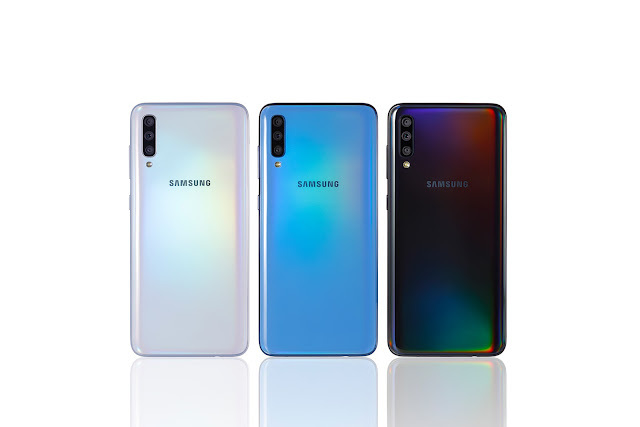 Feel always secured as the Galaxy A70’s new intuitive positioning of the on-screen fingerprint scanner makes it more convenient than ever to control access to your phone for a more seamless user experience without requiring people to reposition their grip. Paired with Samsung Pass, people can sign into websites and apps by using biometric authentication as an easier and more secure way of logging-in. 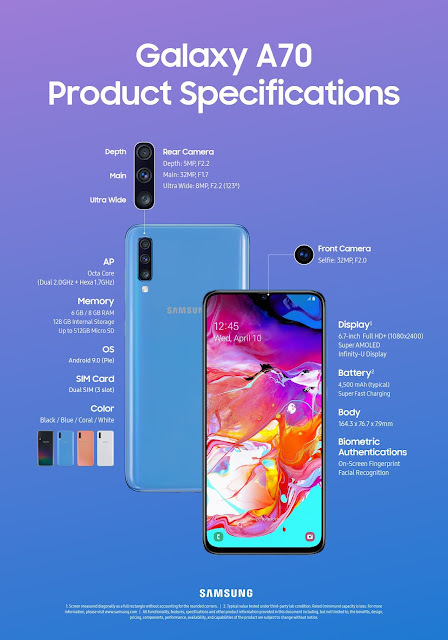 This ease and convenience is enabled by Samsung Knox, Samsung’s defense-grade security platform designed to protect from chipset to software. Samsung Knox gives you a piece of mind about your privacy on the Galaxy A70, so you can use your phone freely with ease.